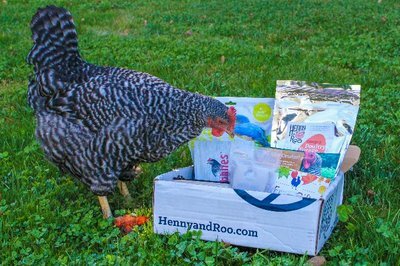 A monthly subscription box of useful and fun products for backyard chicken keepers. Husband's chickens loved the treats. This is a must for the chicken lovers. Wide variety of Fun and useful items!! This box is amazing. I just got one box initially but then I forgot to cancel and I'm so glad I didn't. I've used almost all of the items in the three boxes that I got so far and my chickens are very happy! They have a lot of items from small businesses that I wouldn't be able to get otherwise. I will likely subscribe again soon and get some boxes for Christmas for some of my family. I look forward to this box every month. Always cute and useful items for any chicken keeper. This box was suggested to me since I am a new chicken owner. My friend gets this subscription too. Her box had way more items then mine. I got 3 items for chicken and a towel for me. There was no welcome card or description card. I don't know what the Henny Herbs are for. My friend gets a lining for her nesting box, I didn't. My next question is why should I keep doing the subscription box? Very disappointed. If you LOVE your chickens, get this box! Loved everything in the 1st box! I got it for my good friend & neighbor because she is always sure I'm stocked up on fresh eggs. She loved all the new treats to try on her flock and was so excited to see that she got a couple treats herself! I am going on my fourth month of getting these boxes. I love them. It's such a treat for my girls and myself. I love the fact it help builds my first aid kit for the girls and introduces me to new products. Have I said I love these. Thank you so much. I am going to Henny & Roo. So far I got Pet Treater for Wally (my Lab mix) and ever month the box is a hit. I highly recommend them. I loved this box more than any other subscription box I have received. My girls are in for a real treat. Thank you for an eggsellent box.